Enjoy this fantastic unit. If comfort is what your looking for, look no further!! 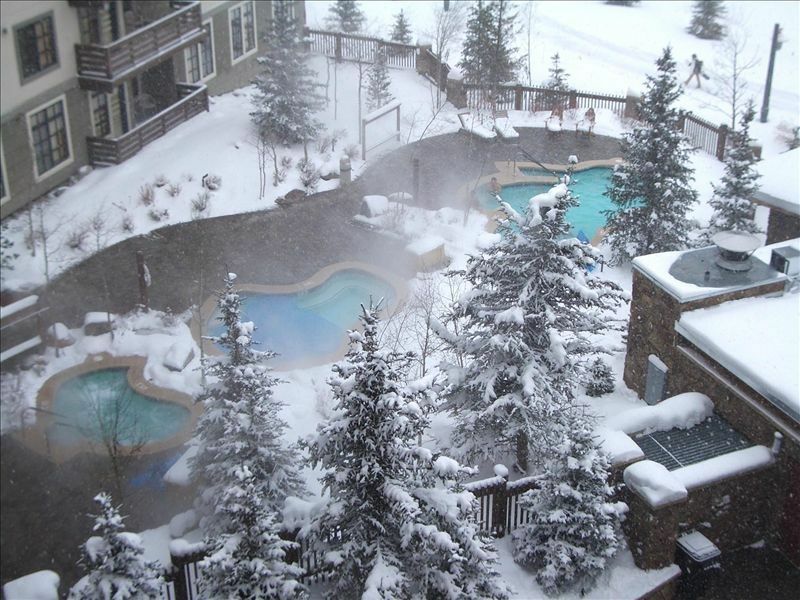 This non-smoking, condominium located in the heart of Copper Mountain Village. Sit on our private sixth floor balcony and enjoy views of Copper Mountain Village, and the surrounding mountains, or relax by the fireplace after a full day of mountain activity or Soak in the three large hot tubs. You have EASY access to all the unique shops and restaurants, the outdoor climbing wall, the golf course, the West Lake, and the Center Village. This condo accesses both the American Eagle and American Flyer High-speed quad chairlifts. Accommodations in this beautifully furnished home include one king-size bed in the master bedroom (which features an en suite bath). This unit has got it all: full kitchen, VCR player and cable, telephone, gas fireplace, private balcony. TV's in the master bedroom and living room, and private underground parking! Exercise room on first floor, laundry room located on the second floor. ABOUT COPPER MOUNTAIN: Known as the 'Locals Favorite,' Copper Mountain is the largest ski and snowboard resort in Summit County. It is also the only ski resort that features naturally separated terrain, allowing beginners, intermediates, and experts to ski and ride on their own distinct areas of the mountain. Its central location (situated between Breckenridge/Keystone to the east and Vail to the west) makes it ideal for the guest who wants to get out and enjoy other resorts as well. Had a wonderful time at Copper mountain. The apartment was spacious and well appointed, the location is ideal. Totally recommend! Overall decent stay. Location is great, plenty of towels and tissue/paper towels.... Excellent common laundry facilities with change machine and soap boxes. Could use some minor things ie loose shower adjustment and some better lighting....... Could definitely use a space heater in the cold master bathroom! All hot tubs were not functional during our stay which was disappointing especially for kids. Great location - bedrooms were ample size, although the master bedroom didn’t have a dresser . The couch was a bit worn, and several of the lights didn’t work, but we weren’t in the room much, and for a short getaway it was great. We really enjoyed this condo and the convenience of Center Village. The kids loved the bunk beds in the second bedroom. Our stay at Copper Mountain was a fun vacation and this condo was a great "home away from home" with everything we needed. My family of 4 was very comfortable in this condo - we stayed 4 nights. The 6th floor unit was very quiet (top floor, so no noises from above), which allowed us lots of rest at night before we spent the days skiing. We made good use of the 3 humidifiers, which kept the air from being too dry, as happens in high elevation. Plenty of towels for the hot tubs. Underground, covered parking and luggage carts made moving in and out easy. Ski locker good for storage. Lots of great restaurants downstairs in the village, but we cooked in a couple of nights, using the well-equipped kitchen. Owner was very professional and responsive. We had a great time and would rent here again. Beautiful condo with plenty of room. We will definitely be back!! 3rd year at Passage Point and this is by far the nicest condo we have had. This place has plenty of room, everything needed in kitchen and very comfortable beds.